On January 28, 2000, LUKoil officially opened its first oil re-loading terminal in Azerbaijan, located in the Khatai District of Baku. LUKoil President Vahid Alakbarov, SOCAR President Natig Aliyev and Alexander Prishepov, Temporary Charge d'Affaires of the Russian Federation, were present at the ceremony. Photo: LUKOIL's President, V. Alakbarov, at the opening cermony for the new refinery. 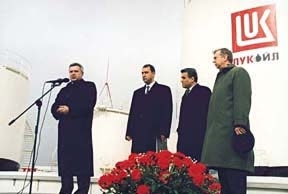 Left to right: LUKOIL Manager F. Aliyev, SOCAR President N. Aliyev, and Russian diplomat A. Prishepov. Fed by the Azneftyanajag refinery, the terminal's ten fuel storage tanks will be able to handle the shipment of 120,000 tons of oil products each year. They will dispense Ai-95, Ai-93 and Ai-76 types of gasoline as well as diesel fuel and kerosene. The terminal also has a laboratory for conducting fuel analysis and a railway loading / downloading pier for importing fuel from other producers. 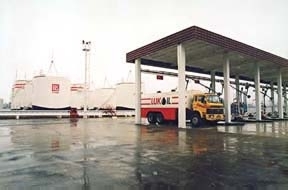 LUKoil opened its first refueling complex (RC) in Azerbaijan in 1995. It now has a whole network of petrol stations that will be able to make use of the higher-quality fuels stored in the LUKoil terminal. "Another step has been made toward the expansion of LUKoil's re-loading complexes network in Azerbaijan," said Alakbarov. He said that he expects that the new terminal will help LUKoil improve and expand its commercial network in Baku. LUKoil is a member of the AIOC consortium (10%) for the development of the Azeri, Chirag and deep-water Gunashli. The company is also involved with Shah Daniz (10%) and the prospective hydrocarbon structure Yalama (block D-222) on the Caspian shelf (60% as LUKAgip). Another entity, LUKOIL-Baku Trade House, is involved with the modernization of vessels, construction and services of drilling rigs. In 1996 LUKoil established a Charity Fund to help Azerbaijan's refugees and the poor. It has also sponsored a monument at the Academy of Sciences to honor Yusif Mammadaliyev, the distinguished scientist and founder of Azerbaijan's oil chemistry.